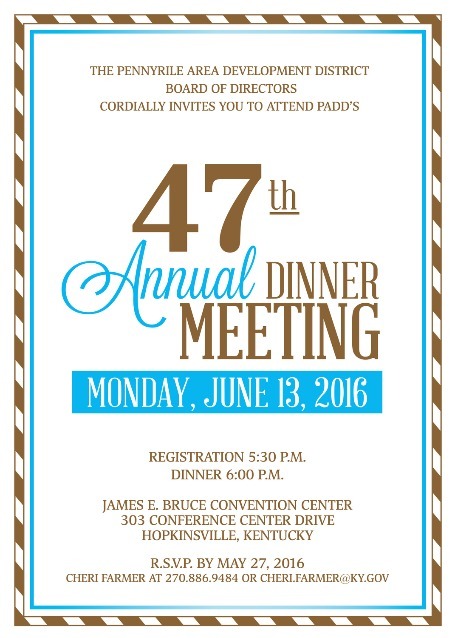 ​The Pennyrile Area Development District (PADD) will hold its 47th Annual Dinner Meeting on June 13th at the James E. Bruce Convention Center in Hopkinsville, Kentucky. Registration begins at 5:30 p.m. with dinner at 6:00 p.m. CDT. The annual event is sponsored by Planters Bank of Hopkinsville and gives all local officials, legislators, business and civic leaders, and others from throughout the Pennyrile the opportunity to celebrate the year’s activities and accomplishments. As a service organization, PADD has provided 47 years of leadership to the Pennyrile region providing the highest quality of professional planning, development, and implementation services in the areas of community and economic development, workforce, transportation, social services and public administration. Special service awards will be presented to Board and Staff, along with the 2016 W. W. “Bill” Bryan Memorial Award. The W.W. “Bill” Bryan Award is in honor of the first PADD Board Chairman, W. W. Bill Bryan, who was instrumental in the formation of PADD in the 1960’s. This special award is presented each year to an individual or group of individuals who have made outstanding contributions and serve as great examples of the regional cooperation and leadership in various exemplary ways. Guitarist Alonzo Pennington will provide music during the evening. Entertainment for the evening will be provided by Mr. Eric Dittelman, “Mind Reader”. Ever wonder what it would be like to know what someone else was thinking? What if you knew exactly what someone else was going to do before they did it? Eric Dittelman, knows what that’s like and has been reading minds at theaters, colleges, comedy clubs, and corporate events all across the country. Often known by just his surname, Dittelman combines amazing mind reading with stand-up and improvisational comedy. PADD is one of fifteen Area Development Districts in Kentucky and is the primary regional planning and development agency for the nine county area of: Caldwell, Christian, Crittenden, Hopkins, Livingston, Lyon, Muhlenberg, Todd and Trigg. The 39 member Board of Directors is currently chaired by Muhlenberg County Judge Executive Rick Newman. For more information or to RSVP, contact Cheri Farmer at 270-886-9484 or via email at [email protected] by May 27th.